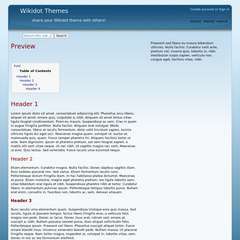 A corporate themes based on Microsoft's Download Centre here. It has a top menu and also has a wide sidebar on the right hand side which is useful for articles, blog entries, images and calendars. For resolutions of 1024px wide and above. Developed in Firefox 3.6 and tested on IE8, Chrome and Safari (on PC). Filters have been added so it should also work on IE7. This is a great looking, simple, clean theme. Can't wait to use it. Nice work and thanks for sharing!